Overplay offers an all round package including the addition of a SmartDNS service. SmartDNS system part of the package. Mobile apps not released yet. 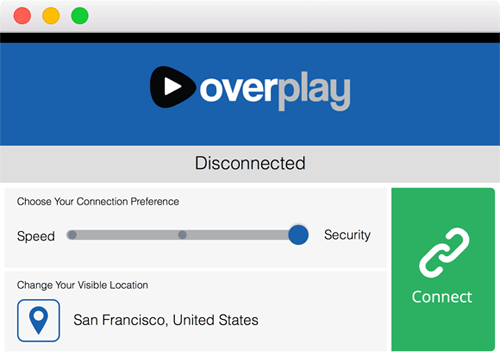 Overplay are a VPN provider that offers something a little different to the masses. Alongside their VPN package they bundle a SmartDNS service. I’ve been taking a look at their service to see how it stacks up against the competition and if it’s worth you parting with your hard earned cash to sign-up for. Overplay, unlike most other VPN providers, offers two types of service. The first is their standard VPN package that comes bundled with SmartDNS access, the second is SmartDNS access on its own. If you want privacy and protection of your online connection then you’ll need to opt for the VPN package but if you only want to access geoblocked entertainment content then the SmartDNS package may be enough for you although it’s worth noting that it doesn’t afford the added protection that a VPN does. The packages are priced as follows. Like most other providers the longer you sign up for the bigger the saving so it’s worth considering how long you’re going to need the service for before signing up as you could save some cash by taking a longer subscription length. It’s nice to see a 3-month package option available which isn’t that common in the VPN industry. I found the 12-Month VPN package to be slightly higher priced than some of the competition out there. For example, IPVanish is nearly $20 a year cheaper so they might be worth considering first. Overplay supports the three most common VPN protocols PPTP, L2TP and OpenVPN giving you a variety of choice when it comes to connection types. In this review I’ll be concentrating on the VPN package which includes SmartDNS as standard. This means if you want to watch geoblocked content then you have the option of using the SmartDNS system that should, in theory, reduce any speed loss that a VPN may introduce when streaming video. Overplay have custom software for both Windows and Mac systems. Unfortunately there are currently no mobile apps for either Android or iOS. I spoke with Overplay who informed me that both Android and iOS apps are in the works and will be released shortly. Although there are currently no apps it is still possible to use the service on a mobile device and the Overplay website has guides for using both PPTP and L2TP. It would also be possible to use the OpenVPN GUI with config files. If you’re wanting to use the service on a mobile device I recommend that you’re comfortable following guides or know a little about how computers work as manual set-up won’t be for the novice. Although with apps about to be released soon enough you won’t need to worry about this. Windows and Mac users are well catered for though from the beginner to the expert with custom software. New software for both systems was recently launched making the whole connection experience a lot smoother so you can basically connect, go and forget the VPN service is even running. There isn’t a lot in the way of features on the software and it will only allow you to connect via OpenVPN but for most uses this is the best possible option anyway and if you’re a new user the lack of options will help save any confusion. The software allows you to easily choose between Speed and Security. This is great if you’re a new user as it simplifies the process although if you’re an expert user you may miss the customisation. There is a range of set-up guides for consoles, streaming media boxes, routers and more on the Overplay website so the service is open to a wide range of devices. The SmartDNS set-up requires a little more tinkering under the hood to set-up but as long as you’re of average computer skill then following the guides available shouldn’t be a problem. If you’re a novice then it’s probably better to stick to the VPN software itself which simply requires one or two clicks to connect. Overplay have over 330 VPN servers in over 44 different countries. They recently expanded massively from a previous 20 countries. Europe is well catered for with VPN servers in many different countries including the United Kingdom, Germany, France, Switzerland, Sweden, Iceland and a whole host more. The United States and Canada cover north America while servers in Australia and New Zealand take care of Oceania. Japan, Malaysia, South Korea, Hong Kong and more are available in Asia while Brazil and Argentina cover South America. A splattering of other countries includes India, Israel, Russia, Saudi Arabia and South Africa plus many more. Overall a good selection of servers in a range of geographic locations should make the service usable in most countries. 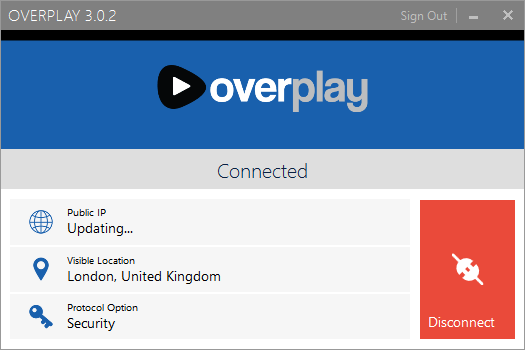 Overplay has no download limits and you’re able to switch servers as often as you wish. The service can be used on up to 2 devices at the same time which can be any combination of computer, laptop, tablet or phone. This is a nice feature as it allows you to protect both your home desktop connection and a mobile connection from the one account. The SmartDNS system might be useful to some users and as it comes built in with the VPN package it gives you the best of both worlds. The VPN service will encrypt your connection and help you increase your privacy while the SmartDNS system allows you to access entertainment services from around the world with minimal speed loss. Of course you can still use the VPN service to access geoblocked content but having the additional feature of a SmartDNS service gives you choice and is one of the main selling points of the Overplay service. I’ve been using Overplay for the last few weeks for my everyday internet use and found them no problem at all. I was able to surf the web, watch videos and access content from other countries without any issues. Downloading wasn’t a problem with Overplay so if you’re a heavy downloader or use torrents or newsgroups a lot then you should be pretty happy with the speeds. As per all our reviews I tested the speed of a selection of servers by downloading a 10GB test file. This was done on a Windows 10 desktop system using the Overplay Windows custom software. The software uses OpenVPN with 256 bit encryption and the UDP protocol. All tests were carried out on Wednesday, 8th June 2016 between 13:00 and 13:30. My connection speed without VPN at the time of testing was 211.55 Mbps. The results show the quality of the Overplay network and based on past experience over the previous few years it shows Overplay has heavily invested in their network resulting in some of the best speeds overall that I’ve seen from any VPN provider. You won’t have any issues downloading or streaming in high quality such as 4k with Overplay and accessing overseas services shouldn’t be an issue either based on these results. Overplay allow connection via OpenVPN, L2TP, and PPTP. OpenVPN via the desktop software allows you to choose between AES-256-CBC, AES-128-CBC and no Cipher by selecting between the Speed and Security slider. A 2048 RSA authentication key is in use regardless of cipher chosen. L2TP uses 256-bit encryption with PPTP using 128-bit encryption. There is nothing overly concerning in the Overplay policies or privacy section. As per usual it stipulates that you can’t use the service for illegal purposes but this type of legal warning is typical across the industry. P2P and torrent use is acceptable but again Overplay state you shouldn’t use this for sharing pirated material. A 5-day money back guarantee is available if you’re not happy with the service. Overplay has an extensive support guide covering a variety of topics and issues you may have with a range of systems. Failing that you’re able to contact them via support ticket online. On a number of occasions I contacted them to ask questions and they replied often in under an hour so it’s easy to get issues resolved or queries answered relatively quickly. Overplay offers a somewhat unique service in that their VPN package comes bundled with a SmartDNS system. It’s competitively priced with some of the other larger VPN providers out there so essentially the SmartDNS feature is a bonus. If you’ll make use of that feature though depends on your own needs. I would like the overall pricing of the service to be slightly cheaper as there are other good services out there such as IPVanish which offer an equally good service but at a few dollars less per month. However, the price is generally comparable with many other options out there. Overplay offers software for both PC and Mac which is extremely easy to use and will be ideal for the novice. If you want to use the service on a mobile device then you’ll need to be confident following instructions and manually setting the service for now which is currently a negative but I’m reliably informed that apps for Android and iOS will be available shortly. A good selection of countries are available to access and the Overplay service has expanded massively in recent months. The speeds I achieved while using Overplay were some of the fastest I’ve seen in the industry and coupled with the locations available open the service up to most worldwide locations. Geoblocked services such as BBC iPlayer work fine on Overplay which is sometimes blocked elsewhere so you’ll be able to view from abroad without issue. Overall Overplay is a great service due to the speeds offered even while using high level encryption. I see no reason why the service wouldn’t be suitable for a range of needs. From encryption for protecting your connection to accessing geoblocked services via their VPN or SmartDNS system there are a multitude of purposes that Overplay is highly suitable for.